Your customers are expecting personalized, 1:1 experiences with your business, but lean support staffs make it difficult to meet these high expectations. Your agents need to provide fast, intelligent service tailored to each individual customer with cases coming in from a multitude of channels. A customer community allows you to create customer service that is proactive instead of reactive. By empowering your customers to help themselves with a robust self-service community, you’re not only exceeding their expectations, you’re also building brand loyalty and freeing up your agents to tackle the more difficult cases. 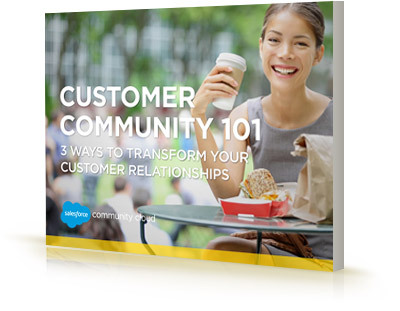 In this e-book, we explore the benefits of a customer community, best practices, and the advantage of choosing a Salesforce community. Download this free e-book today.